This package contains ROS driver nodes for Analog Devices(ADI) sensor products mainly communicate by SPI(Serial Periferal Interface). You need a SPI interface on your PC to communicate with device. This package supports Devantech's USB-IIS as the USB-SPI converter. 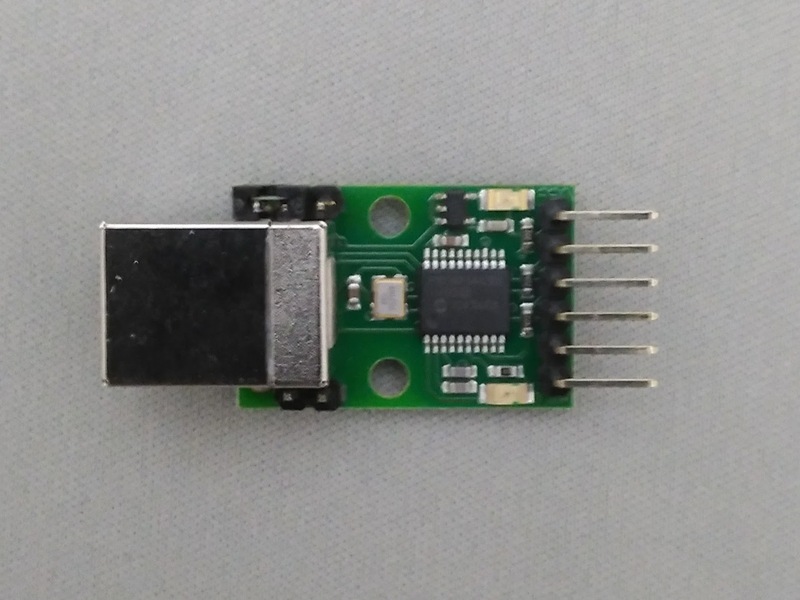 USB-IIS is a USB to Serial/I2C/SPI converter, simple, small and easy to use. You don't need any extra library like libusb or libftdi. The device is available on /dev/ttyACM* as modem device. Please consult the product information and SPI documentation for the detail. You need to remove the jumper block on Power link pins to provide 3.3V for the device. You need to add your user to dialout group to acces /dev/ttyACM* . ADIS16470 is a complete inertial system that includes a triaxis gyroscope and a triaxis accelerometer. You can use Breakout board for easy use. 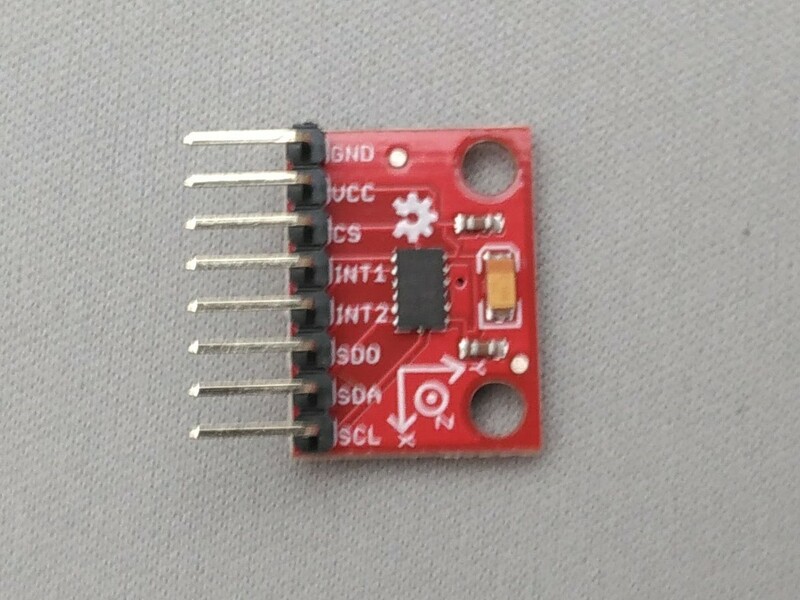 You need to build a flat cable to connect the USB-ISS and the ADIS16470 breakout board. The picture shows a implementation. Very simple schematic is here. 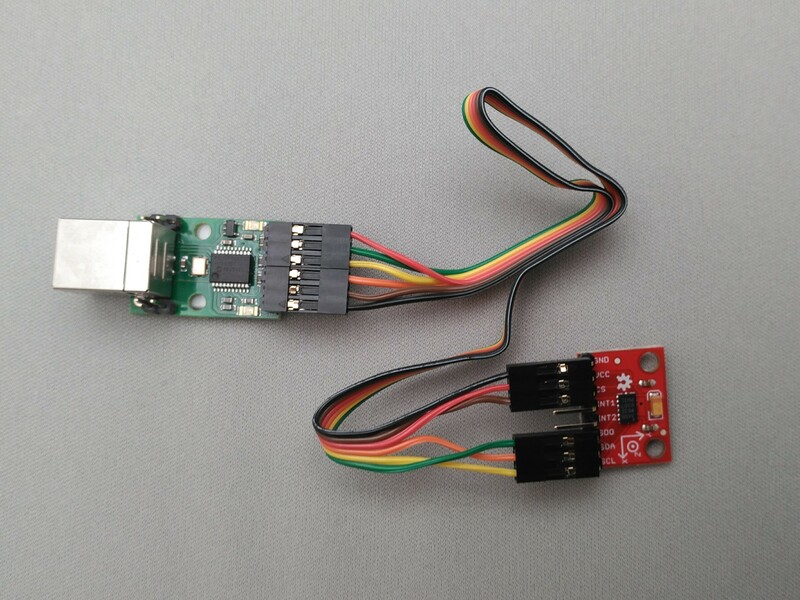 J1 is the USB-ISS pin and J2 is the 2mm pin headers on the ADIS16470 breakout board. Note: you only need to connect one of the power-line(3.3V and GND). They are connected in the breakout board. You can see the model of ADIS16470 breakout board in rviz panel. IMU raw output. It contains angular velocities and linear accelerations. The orientation is always unit quaternion. 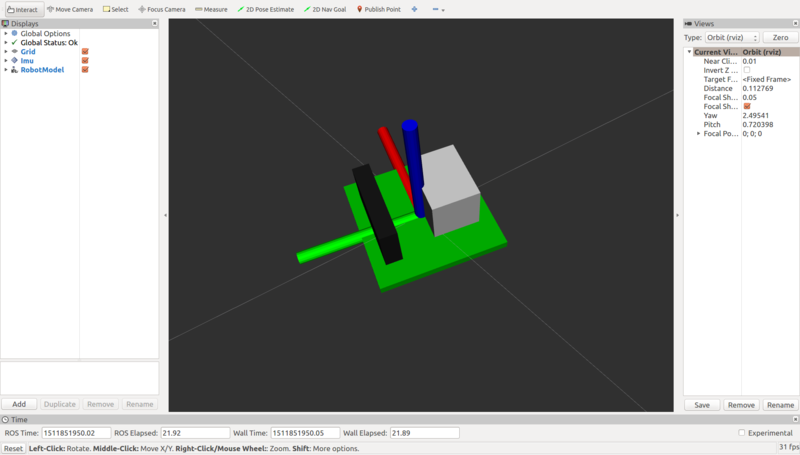 IMU filtered output by imu_filter_madgwick. It contains angular velocities and linear accelerations. The orientation is always unit quaternion. Temperature of the IMU. To publish this message, you need to set true the parameter named 'publish_temperature'. See sample launch file. This service activate ADIS16470's internal bias estimation function. You should call this service after the IMU is placed steady for at least 40 seconds. 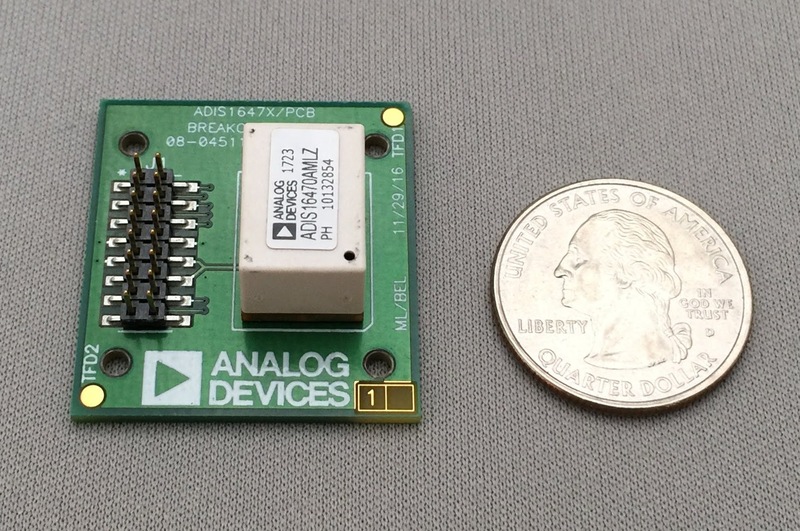 The bias value of the gyro sensors are calcuarated as the average of the duration. The sensor value are obtained after it is substracted by the bias value. The bias value is stored on the chip and cleared when it powered up or reset. The ADXL345 is a small, thin, low power, 3-axis accelerometer with high resolution (13-bit) measurement at up to ±16g. At this moment, support for this device is experimental. USB-ISS 3.3V output can supply up to 80mA. ADIS16495 supply current is 89mA(typical). 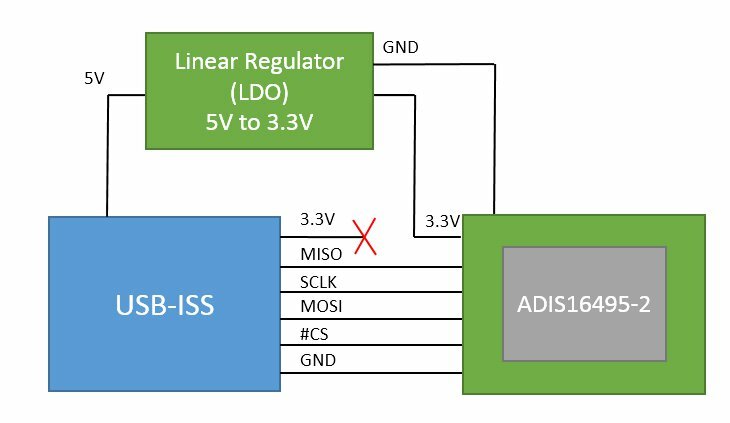 External Linear Regulator(LDO) help power supply requirment for ADIS16495. 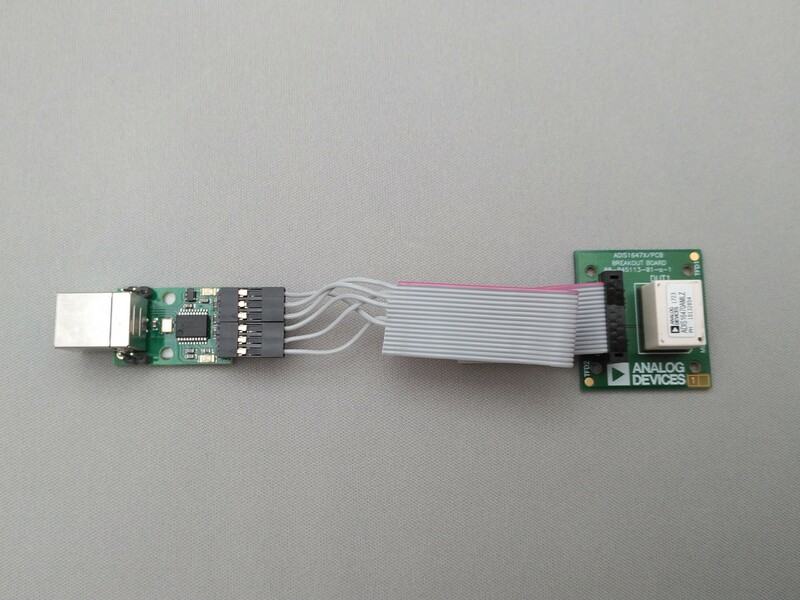 The picture used ADP125(Evaluation board) which is 500mA LDO for 5V to 3.3V. The 5V is from USB-ISS 5V pin.